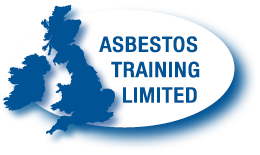 Asbestos Training Limited are proud to announce the opening of our new specialist asbestos training centre located on Hertfordshire/Cambridgeshire border closely linked to the M11, A1, A10 and A1198. 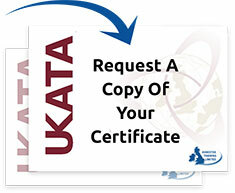 Click here to view our scheduled open courses and booking form. 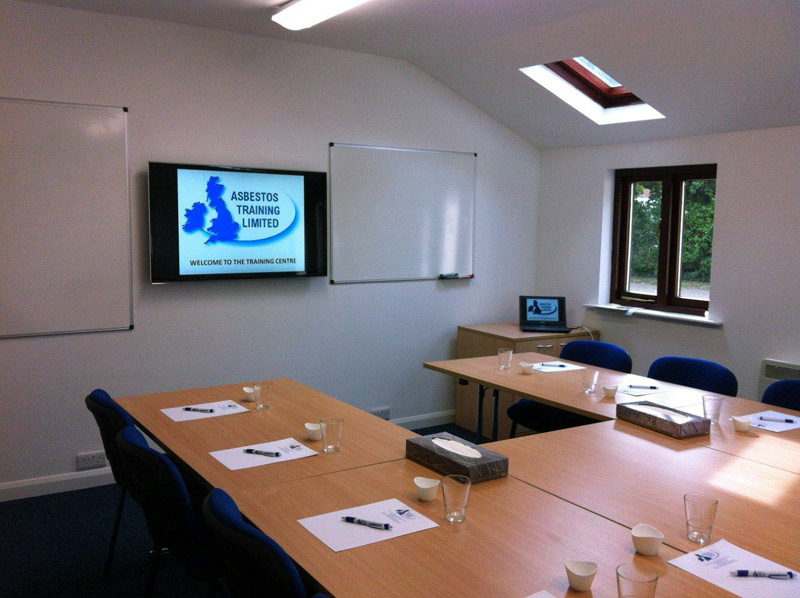 Due to the demand and expansion of Asbestos Training Limited we have invested in providing clients with the use and experience of a modern facility with comfortable and relaxed surroundings. Visitors to the training centre will have access to three suitably sized training rooms, state of the art audio/visual equipment and presentation material, free secure Wi-Fi to all visitors, confortable seating and break out room. With support from our catering partners, all full day courses will include refreshments and buffet lunch. 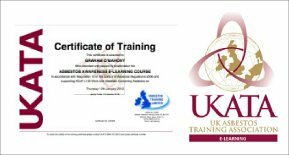 With our new training centre we are now able offer all courses as scheduled or open courses, and will continue to offer the same courses in house for clients at their premises. 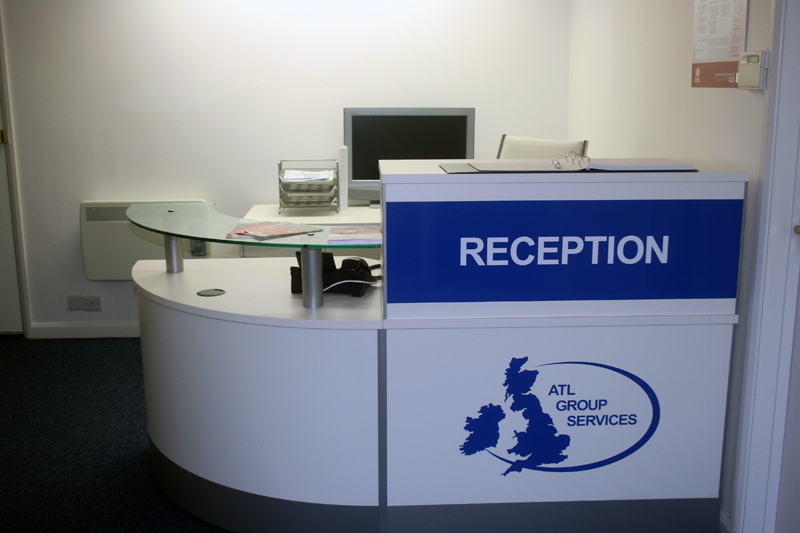 The centre offers a warm welcome from our reception team, with a introduction of the centre facilities and health and safety briefing. 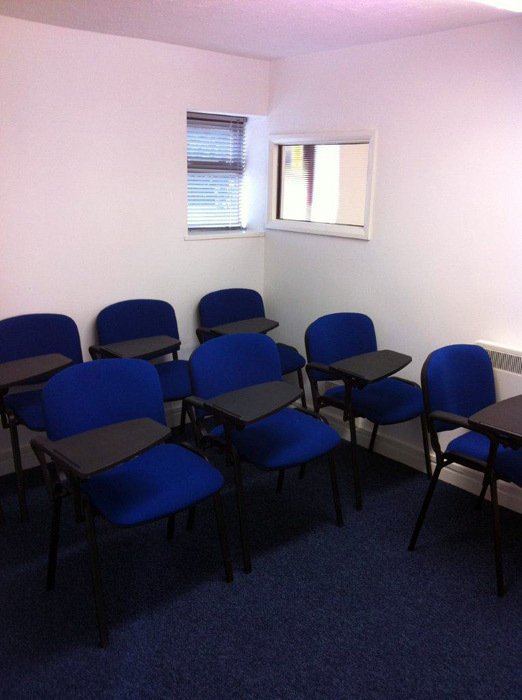 Training Room One – This room is laid to theatre style with specially designed comfortable padded exam desk chairs, with LCD HD Digital TV used for presentation, free WiFi - Ideal for Asbestos Awareness, Unlicensed works and small group training sessions. 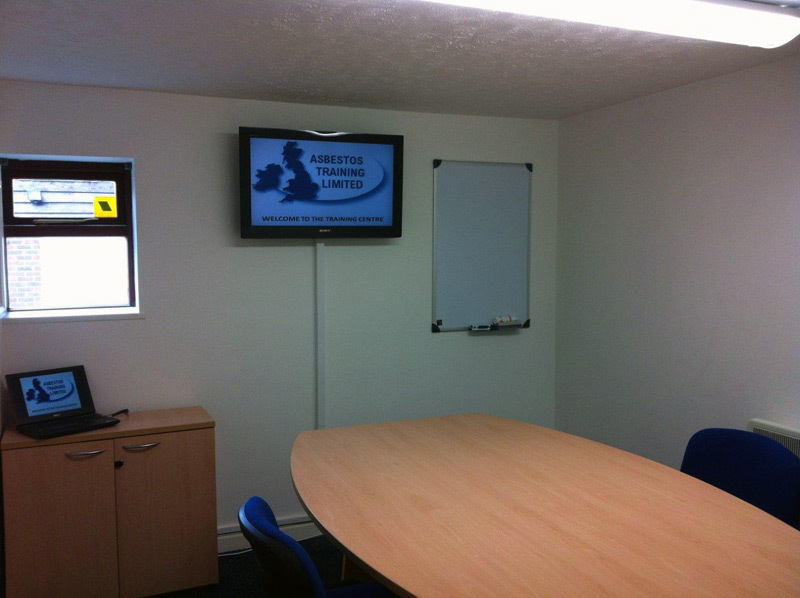 Training Room Two – This room is laid to board room style with board room desk and comfortable padded chairs, with LCD HD Digital TV used for presentation, free WiFi – Ideal for Asbestos Awareness, Unlicensed works, Health and Safety Training and other small group training courses. Training Room Three – This room is laid to "U" Shaped desk, which can be folded easily away for large theatre style laid room comfortable padded chairs, with LCD HD Digital TV used for presentation, free WIFI – Ideal for larger group courses, health and safety training and open group seminars. 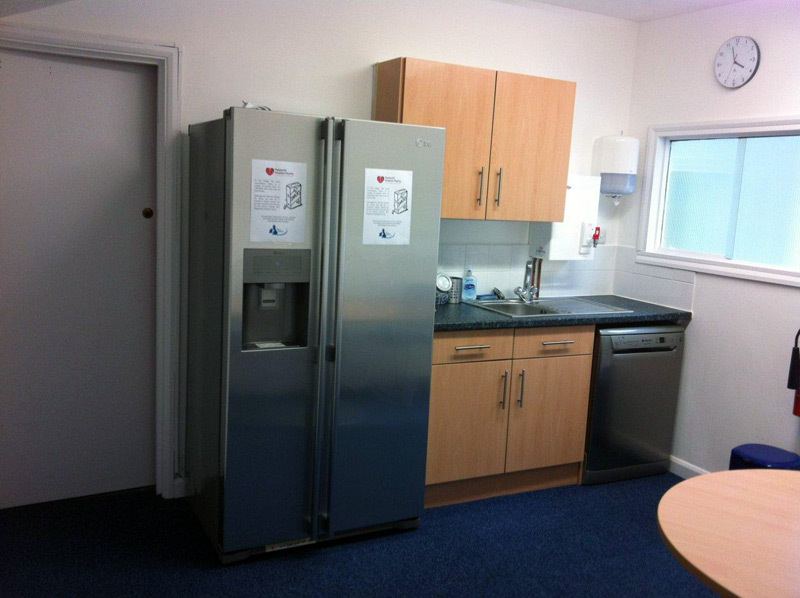 All delegates have access to the "Break Out" Room, with kitchen facilities, fridge, hot water and cold water drinks machine, Digital TV for relaxing during breaks and keeping up with the news of the day. 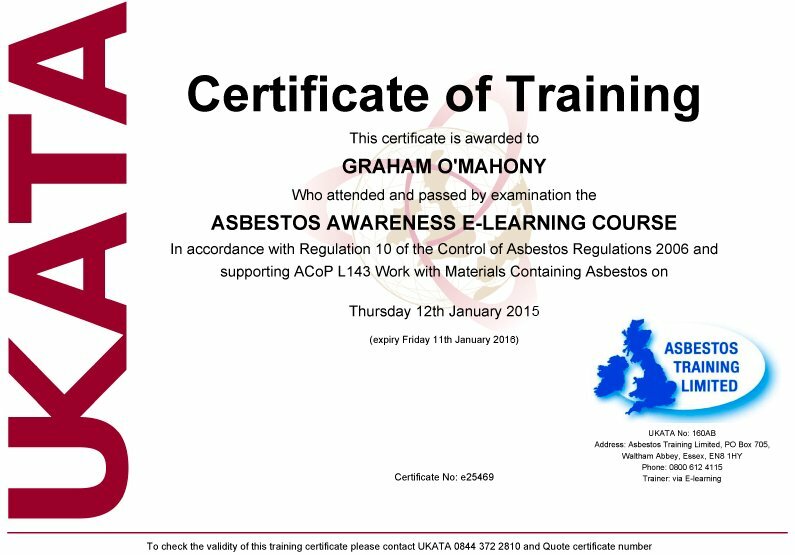 For more information on our dedicated asbestos training centre please contact us on 0800 612 4115.